BOB Specialist Officer Syllabus: For all the candidates who are appearing for the BOB SO Exam we would like to present to you the Bank of Baroda Specialist Officer Syllabus 2018. Candidates who are preparing to appear for the exam are urged to check out detailed syllabus we have provided here. You can also download the BOB SO Syllabus PDF 2018 from the link we have provided below so that you can keep it on your device for reference as you prepare for a very tough SO Recruitment Exam. Also provided on this page is the detailed Bank of Baroda SO Exam Paper Pattern. The Paper Pattern details the subjects that will feature in the exam. It also provides information regarding the marks weightage allotted to each subject, It is vital that you go through this information as you prepare for your exam. So keep on reading to find all the details regarding the BOB SO Exam Paper Pattern and Syllabus PDF and don’t forget to share this page if you feel the content has helped you. Remember that you can download and share the BOB SO Syllabus PDF file for free! The Bank of Baroda SO exam will feature a 200 mark question paper which will feature MCQ type questions. The major subjects that will feature are English, Subject Knowledge, Reasoning and Quantitative Aptitude. The Exam duration will be 2 hours. There is a negative marking scheme in place for this exam. The candidates will be penalized 0.25 marks per wrong answer. All in all, this is expected to create a fair marking system for the candidates. Check out the complete Exam pattern provided below. The BOB SO Syllabus contains details regarding all the important subjects that are set to be featured in the Specialist Officer Exam 2019. You can check out this list of important subjects below. 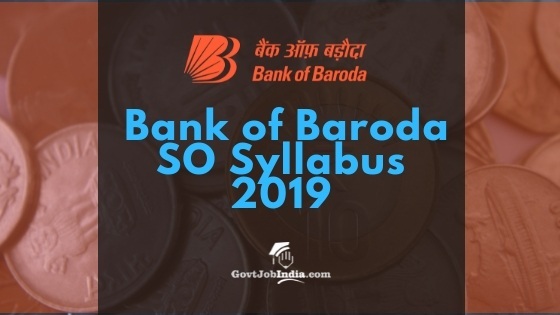 Furthermore, we would like to bring to your notice the Bank of Baroda Specialist Officer Syllabus PDF Download link provided below the list of subjects. You can download the syllabus from this page for personal reference. It is also free of cost and you can download and share it at will! We hope that the Bank of baroda Syllabus and Exam Pattern provided here has been of help to you. Don’t forget to download and share the Syllabus pdf as it will certainly be of use to other candidates as well. Feel free to ask us your queries in the comment section below as we are always available to provide support.